Tales abound explaining how a red bicycle came to be lodged in a Vashon tree a dozen feet up. Some say it ended up there by chance, while others contend in was intentional cleverness. One former Islander, Berkeley Breathed, even wrote a children's book about the mystery. But one longtime Island family had laid a solid claim to the bicycle in a tree just north of Sound Food. Two generations concur that the bicycle belonged to Don Puz, who in 1954 left his bicycle in the woods, forgot about it and never went back looking for it. Don received the bicycle as a donation after the family home burnt down, he said. The bicycle wasn't his favorite — it had hard, solid rubber tires "and skinny little handlebars like a tricycle," he said. "I was too big a kid to ride it." As his mother Helen Puz tells the story, Don and his friends were playing in the woods together, and Don was the only child who had ridden his bicycle there. When the boys left, Don left his bike behind, walking home with the other boys. "Apparently, he wasn't too excited about that bike," she said. After the bike was discovered, making headlines, both mother and son paid it a visit. "We went down there in the woods, and there was this bike in the tree, and I said, 'That's my bike,'" Don recalled. "I recognized it immediately. When I saw that bike, I recognized it, because I don't think I've ever seen another one like it." 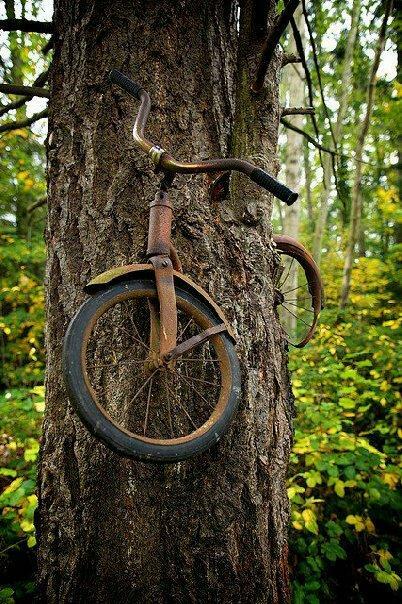 Don Puz said nothing about leaving his bicycle chained to a tree, so given the current position of the bike within the tree, most likely one or more persons had a hand in moving it after Don abandoned it back in 1954.